E In 2014, the Ministry of Education of Thailand announced that it would start following the CEFR standard for language learning in Thai schools. Modulo Language School was already using this system, even before the announcement. Get ready ! The Common European Framework of Reference for Languages: Learning, Teaching, Assessment, abbreviated as CEFR, is a guideline used to describe achievements of learners of foreign languages across Europe and, increasingly, in other countries. Its main aim is to provide a method of learning, teaching and assessing which applies to all languages in Europe, such as English and French. 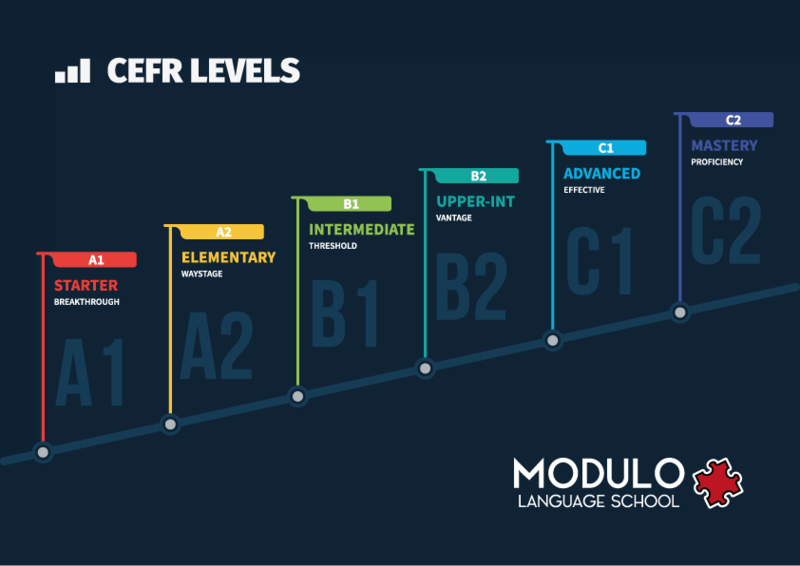 The six reference levels (see above) are becoming widely accepted as the European and international standard for grading an individual's language proficiency. Try our free online test! Step 1 First contact Contact us Getting in touch with one of our language advisors is the first step to successful language learning. Whether you call or message us, we will take good care of you and ensure you get the personalized learning experience you deserve. Step 2 Wants Wants analysis What you want is at the heart of everything we do at Modulo. We will ask you a few questions about your goals and dreams, about how you plan on using the language, and about how you prefer to improve your skills. Business, Conversation, IELTS, Travel, School, etc. Step 3 Needs Assessment/Demo Let's find out what you need. Book an appointment with one of our teachers to analyze your strengths and weaknesses in a relaxed environment. If you're a beginner, we will teach your first lesson to show you what we can do. Step 4 Solution Personalized solution Now that we know what you want and what you need, we can work together to find the best possible solution so you can reach your objectives. We will recommend a level to study at and a specific course to follow, as well as a detailed timeline. Courses for all ages, skill levels, goals and styles. Step 5 Learning Studying the language Not only will you study with our excellent Modulo teachers, we will ensure your progress and satisfaction with regular Checkpoint units and ask you for feedback on how the course is going so we can continue improving your learning experience. Review units and progress tests are key to learning.